Sentences are made up of words and phrases that help convey a given thought. We often use sentences in essay writing, story writing, and even when writing our own speech. Though the way these sentences are structured never really mattered during our early years at school, as we grew older, we came to learn just how important it is to construct proper sentences for better communication. You may also see parallel sentences. 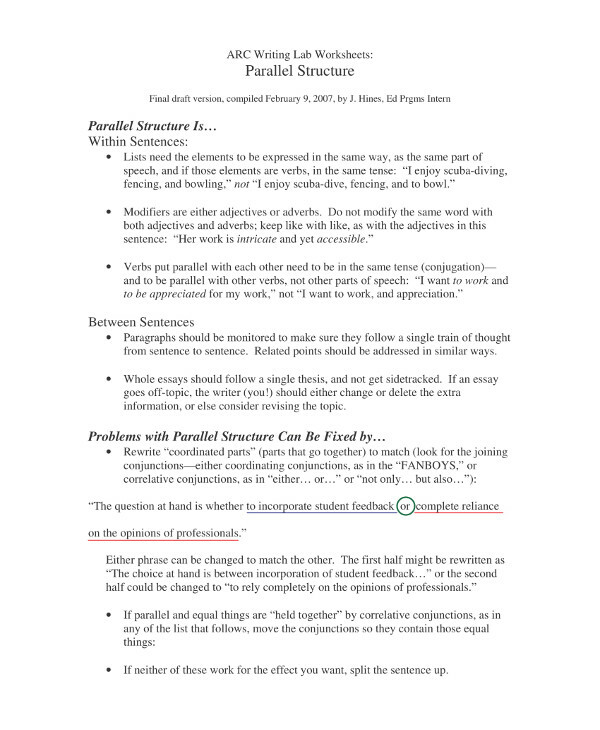 A parallel structure is one of the things that English professors and teachers require students to learn about in order to refine their writing skills. 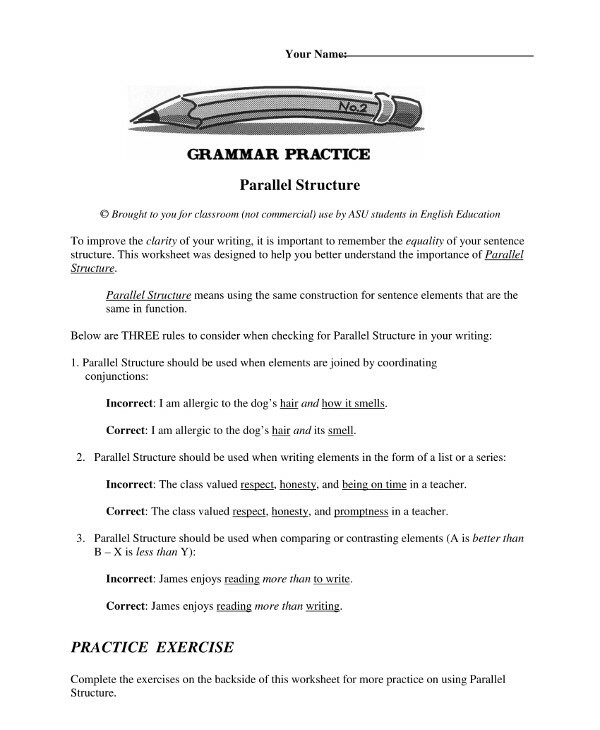 As an essential component of sentence construction, understanding what a parallel structure is and how it is applied is extremely important. So in this article, we take on the basics of parallel structures along with a few examples on how they are used in literature and everyday speech. You may also see balanced sentences. Whenever you make a list of items or actions in a sentence, using equal grammatical units is crucial. If the first item stated in the list is a noun, the following items should also consist of nouns; if the first action is a simple past tense verb, then the succeeding actions must be in the simple past tense form of the verb as well. You may also see cumulative sentence examples. 1. Everyone in class capped their pens, were closing their textbooks, and zipped their school bags as they tried to alert the professor that the sound of the bell signaled the end of the lecture. The words capped and zipped are both classified as simple past tense verbs, but because the phrase were closing is a past progressive, the example cannot be defined as a parallel structure. You may also see flow chart examples. 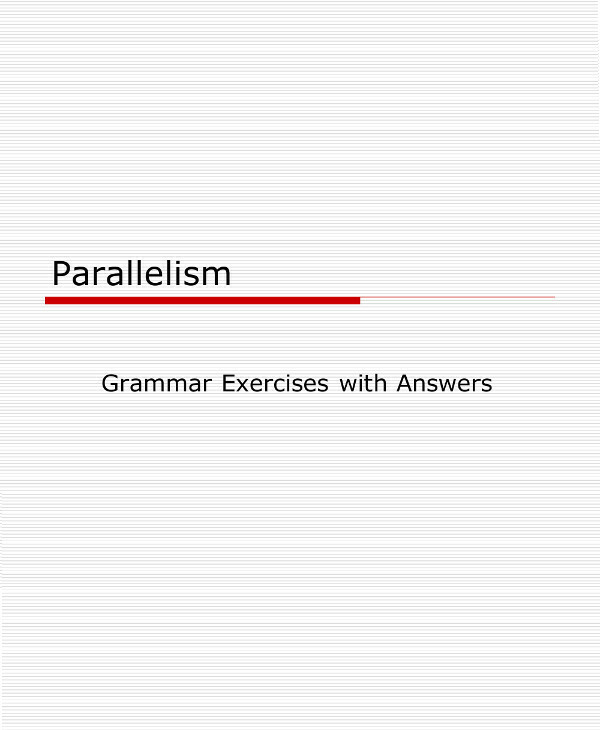 Therefore, a parallel structure, otherwise known as parallelism, is a stylistic device used to increase the readability of one’s writing by creating a word pattern that readers can easily follow. It’s a grammatical construction carrying two or more clauses, phrases or words, with a similar grammatical form and length. Using a parallel structure can help add clout and clarity to one’s writing in the best way possible. You may also see dependent clause examples. 1. Everyone in class capped their pens, closed their textbooks, and zipped their school bags as they tried to alert the professor that the sound of the bell signaled the end of the lecture. 2. Everyone in glass gathered their pens, textbooks, and school bags, as they tried to alert the professor that the sound of the bell signaled the end of the lecture. You may also see simple sentence examples. 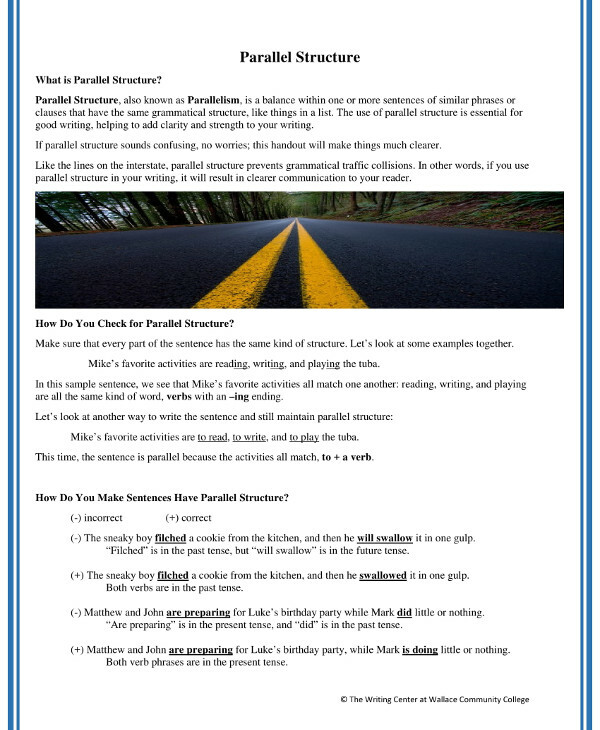 As you may have noticed, using a parallel structure builds a unique rhythm between the lines which offers an enjoyable time and experience for readers to absorb and understand ideas, concepts, and facts in a different way. A parallel structure can be used in a variety of ways. But when proofreading for parallelism, you need to be extra careful in regards to how these sentences are constructed. Otherwise, your sentences may come out completely awkward for readers to grasp. You may also see balanced sentences usage and examples. This happens when you connect two or more clauses or phrases with the coordinating conjunctions for, and, nor, but, or, yet, or so. My boyfriend took me dancing and to a concert. My boyfriend took me to a dance and a concert. Every morning, I make my bed, drinking coffee, and brush my teeth. Every morning, I make my bed, drink coffee, and brush my teeth. I drank some orange juice and was kissing my parents goodbye before I ran out the door. I drank some orange juice and kissed my parents goodbye before I ran out the door. This is done when you have to connect two clauses or phrases with a correlative conjunction (not only…but also, either…or, neither…nor, if…then, etc.). These correlative conjunctions must have equal grammatical units applied after both parts of the conjunction. You may also like how to write short sentences. Not only did Mrs. Carter give the class a smoldering look, but she also was assigning 50 extra pages of homework as punishment for everyone who failed to pass their assignments on time. You might be interested in bridge sentences types and examples. Not only did Mrs. Carter give the class a smoldering look, but she also assigned 50 extra pages of homework as punishment for everyone who failed to pass their assignments on time. Either you like performing or you don’t like to perform. Either you like performing or you don’t like performing. My little brother not only likes to play catch, but also chase frogs. My little brother not only likes to play catch, but he also likes to chase frogs. 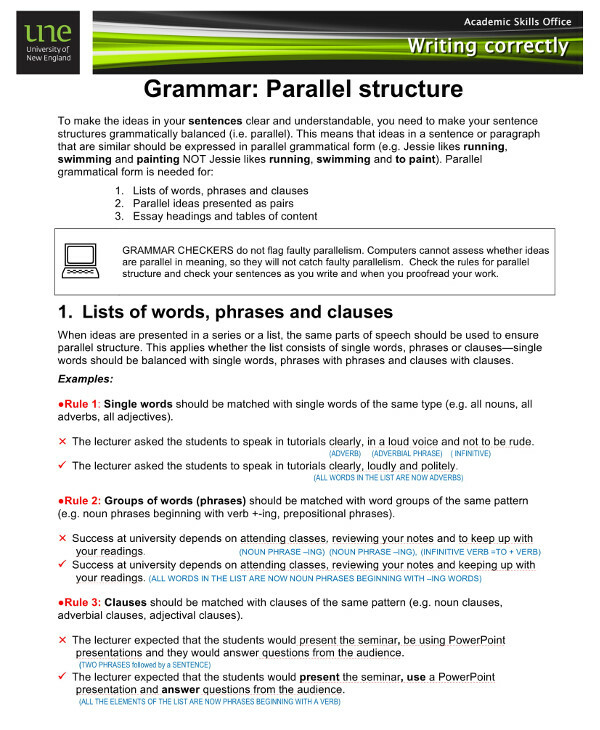 It’s important to use a parallel structure when you connect two clauses or phrases together with a word of comparison, such as than or as. You may also check out periodic sentence examples. I like running better than to bike. I like running better than biking. My mom tried to persuade me that giving is as much a joy as to receive. My mom tried to persuade me that giving is as much a joy as receiving. It’s harder to take the leap than settling for less. It’s harder to take the leap than to settle for less. It’s common to use a parallel structure with elements in a series or list. Jonathan enjoys hiking, swimming, and outdoor activities. Jonathan enjoys hiking, swimming, and being active. The neighbor’s cat ran across the garden, jumped over the fence, and was waddling toward the front door. The neighbor’s cat ran across the garden, jumped over the fence, and waddled toward the front door. The group exhibited collective survival, mutual aid, and being responsible for one another throughout the test. The group exhibited collective survival, mutual aid, and responsibility for one another throughout the test. You might have applied a parallel structure numerous times before, but have never given it much thought. That’s because parallel structures often come to us naturally when we communicate with others. Not only can this add clarity to our statements, but it can also make our words a lot easier to understand. 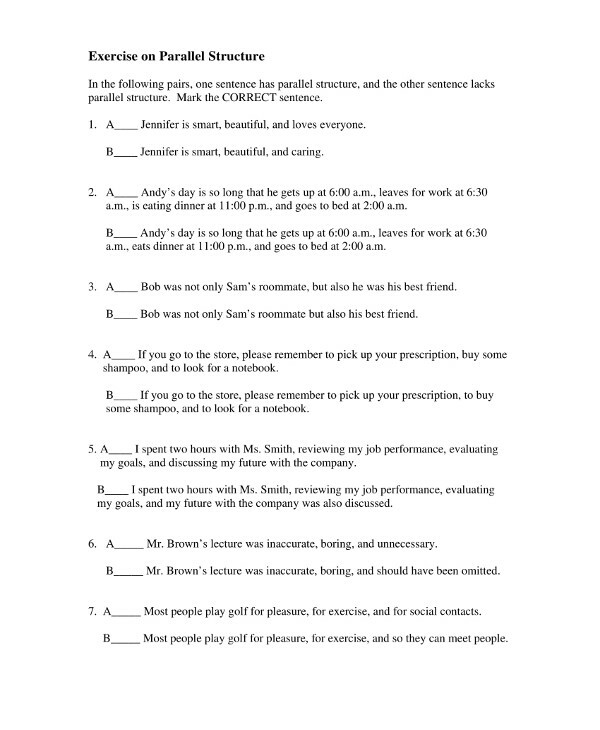 You may also check out complete and incomplete sentences examples. The teacher told them that they need to study for every exam and that they should prepare for a recitation during every encounter. Tim was popular among his employers because he always arrived on time, he was very motivated, and he was a good speaker and listener. You might be interested in imperative sentence examples. The following activities are a part of our daily chores: running errands, cooking lunch, and cleaning the house. The manager wanted to make sure that Jane made her marketing presentation creatively, effectively, and persuasively. Matt and Emily argued not only about the story line, but also about the cast. Hannah is responsible for stocking merchandise, taking orders for delivery, and giving out vouchers around the block. 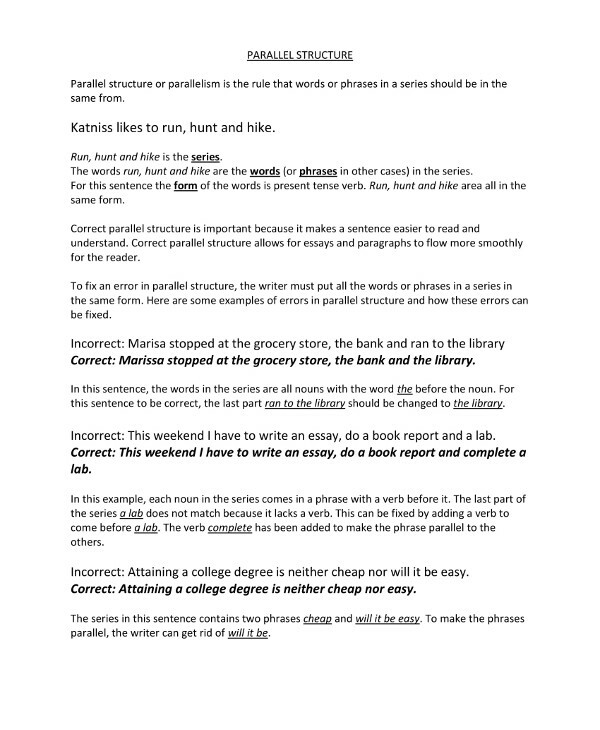 You may also see examples on how to write a sentence outline. At a private learning institution, extreme acts of vandalism can result in suspension or even expulsion from the school. She likes to read and to sing during her free time. According to studies, abused children typically show one or more of the following symptoms: rebelliousness, restlessness, withdrawal, and depression. You may also like exclamatory sentence examples. As much as we use parallel structures during everyday conversations, many literary writers use parallel structures to deliver their ideas in a way that readers could fully grasp as well. You may also see compound sentences examples. You can see how perfectly the author has applied the essence of parallelism in this excerpt, especially in the first two lines. Though the author has clearly combined several elements into her writing, she has also given them a balance by using parallel clauses. You may also see fused sentence examples and corrections. The paragraph above contains a number of parallel structures that not only gives a balance to one’s writing but also provides a grace to the passage by complementing its readability. You may also like cumulative sentence examples. Notice how the first three sentences in this excerpt start in a similar way. But as you continue reading the rest of the lines, you’ll notice how the author follows another, similar structure, which also presents a perfect example of a parallel structure. You may also check out preposition sentences examples. You might have noticed how a parallel structure provides flow in a sentence. This creates fluency in writing and enhances readability by creating a pattern of words in such a way that readers could easily follow. It also makes it easier for us to determine the relationship shared between each word, phrase, or clause used in the given sentence. This technique is most preferable in writing and advertising, as it makes our language seem a lot more refined than normal. A parallel structure also lends consistency in professional writing, allowing writers to create a rhythm and balance with their words that will lead readers to the exact idea being conveyed. As a writer, having the ability to synchronize, repeat, and emphasize your words and thoughts with the use of a parallel structure is something that must be valued and applied correctly. You may also check out examples of oxymoron in sentences. Keep in mind that any parallel structure error committed can make you sound strange to audiences. This is why many linguists and professors encourage you to study this concept and the language even further for better comprehension. You can test your writing abilities by taking various exams, including the SAT, that will require you to locate and revise parallel structure errors as a way of improving your skills. You might be interested in compound sentence usage and examples. Parallel structure helps keep your writing balanced and makes it easier to understand. In doing so, it also shows that the ideas written in a sentence or paragraph are all of equal importance. Not only should the words and phrases match in structure but in tense as well. So the next time you find yourself writing any form of composition, make sure to apply a parallel structure to add value to your words and to keep it structurally and grammatically correct. You may also see complex sentences definition and examples.